Price includes full colour digitally printed centres. Please get in touch for tail printing options. Minimum order of 60 rosettes. Not only can we print the wording of your choice and position, but also a logo of your choice can be added, simply upload it when ordering! If you don’t have a logo in mind, we have a huge stock selection please enquire. Or if you prefer the tradition gold foiled centres, just ask, again, all included in the price. Minimum quantity of 60 can be made up from different ranges Produced in high quality satin ribbon. This not only gives the rosettes an excepionally luxurious feel, it enables them to hold thier shape and remain crease free. 68mm centre as standard. The resulting rosettes are considerably larger than a smaller centre allows. Supplied with 2 x38mm wide , 220 mm long tails. Have your club/event name and any stock logos incorporated in the centre. For orders over 250 rosettes we offer a discount so please just get in touch for a quote. 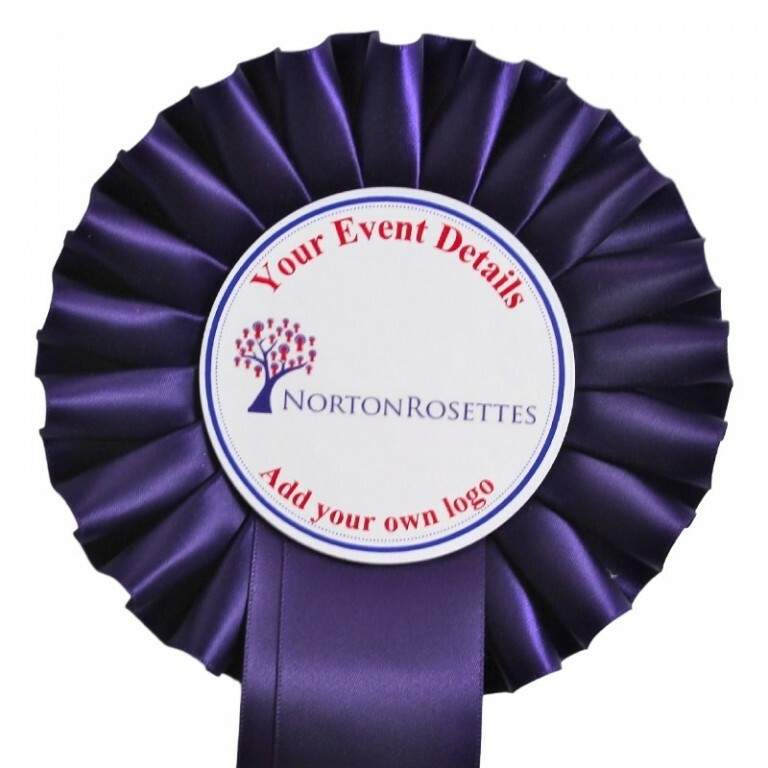 * We have made rosettes for 15 years , and are proud to have supplied events as far apart as Australia and Greenland , from one to tens of thousands. * The highest quality British made satin ribbon we can source. Virtually crease resistant holds the best possible shape. * A superior Elizabethan ruffle pleat to create the tiers, making the Rosettes as luxurious as possible. * A 69mm centre, making our rosettes approx. 25% bigger than made around the more standard 55mm centre. * Centre printing in full colour digital print, including your own logo or the more traditional metallic foiled centre (please see our Customize your rosette information). * Tails that are also approx. 25% longer than those offered by our competitors, all made for the wider 38mm ribbon. Please allow 4 weeks for bespoke orders. If you need your order sooner, please call us on 01697 476911 to discuss your requirements. © Norton Rosettes 2016. All rights reserved.